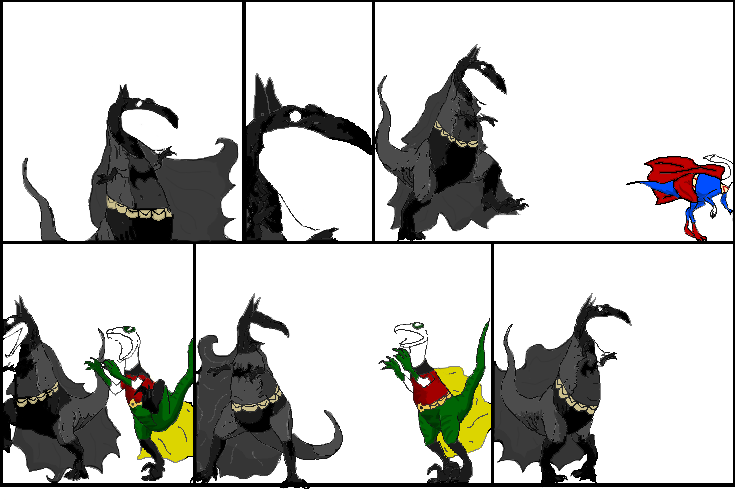 Dinosaur Comics - October 27th, 2010 - awesome fun times! –The English language needs to evolve to keep up!! Two days ago, David, Matt and I had an anthology based on a comic I wrote five years ago, one that had been rejected by every publisher we brought it to, no matter how much they liked it: "anthologies don't sell", we heard, "unless you have some big names attached to it." We didn't have big names (at least none that the publishers would recognize), we just had great stories, each illustrated by a cartoonist. We have a post talking about this here. So we decided that we'd just sell it to you. We picked a day - yesterday - and asked you, if you were interested, to pick it up off Amazon. Our goal was to get to the top of the Amazon book list for just a single day, without a big publisher, without an advertising budget, relying on pure word of mouth. And in a matter of hours, it happened. Yesterday, Machine of Death became the #1 best-selling book on Amazon.com. It hit #1 on Amazon's bestseller list at around 1 pm, and it's been there ever since. In the process, we ALSO topped out their "Movers and Shakers" list, with a 685,800% increase in sales! The machine of death inbox has emails from the giant bookstores, from audiobook companies, from people interested in bringing the book to other languages, and even an email from the New York Times. The New York Times, everyone. You did this. You made this happen. It's incredible. Thank you all for your orders yesterday. We're still Amazon's #1 best-selling book, and we're going to have some more announcements about the Machine of Death anthology as soon as possible. So far, we've announced that if you forward us your Amazon receipt, we'll send you the eBook version for free, when it's ready. We're working on that right now. Yesterday was incredible, and it's all thanks to you! You are all basically awesome. If you haven't bought the book, now's still a great time: Amazon cut the price on the book by almost half to less than $10, so you can pick it up super cheap. Thank you again to everyone who mentioned the book, who made a blog post about it, who posted to Twitter, and who bought copies in order to make this happen. Yesterday was amazing.